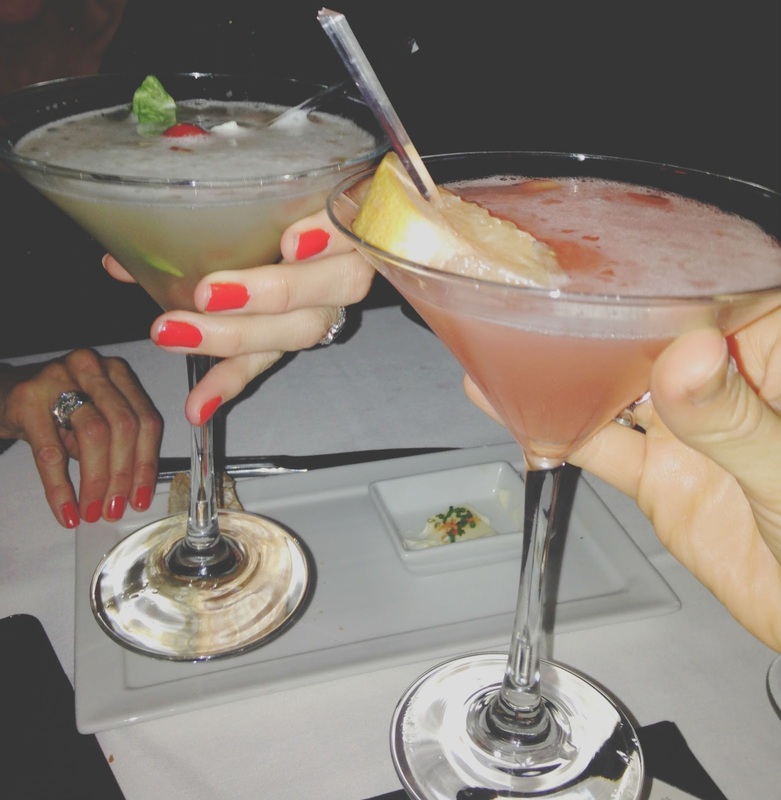 This post was done in partnership with Eddie V's, who partially comped my drinks and food. I was not monetarily compensated for writing this article. All opinions are completely, 100% my own! Step inside my Aston Martin. I was invited to attend last week's SPECTRE premiere event at the Eddie V's located in Houston's West Ave complex. 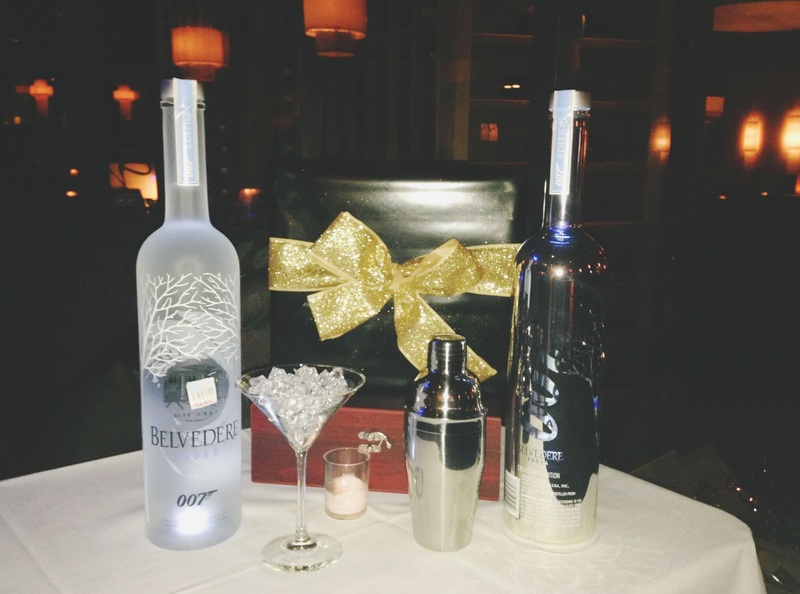 This fun food and drink event featured a James Bond-inspired Belvedere martini list, and my favorite Bond girl (aka my mom) joined in on the fun! 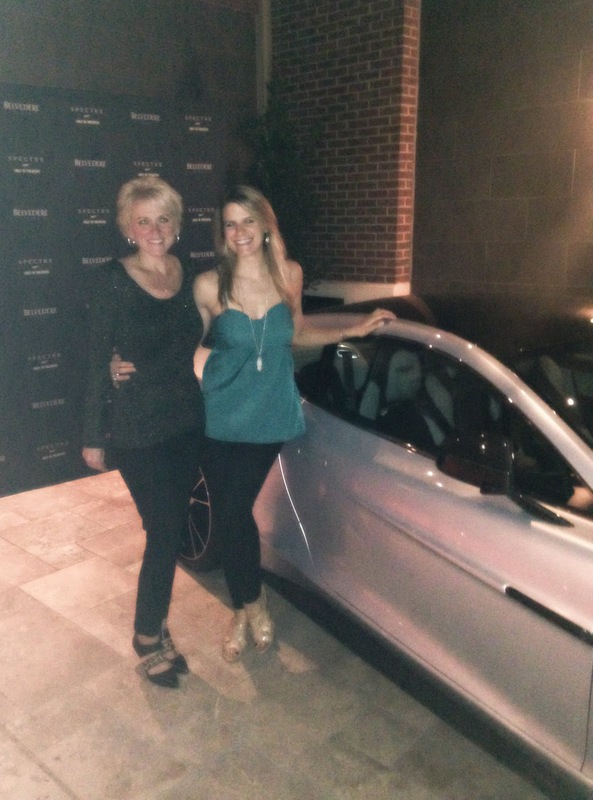 From the Astons parked out front, to the Belvedere display in the restaurant's lobby, to the jazz band playing Bond tunes, this swanky Houston night was one to remember! Once seated in the restaurant's elegant, dimly lit dining room, I couldn't stop eyeing the "caprese royale" - a martini made up of Belvedere vodka, lemon, and a splash of tomato water, garnished with a chunk of mozzarella and basil. While I opted for this concoction, my mom ordered the "kite dancing" martini - Belvedere, St. Germain, grapefruit juice, and lime. I adored the caprese royale - I literally felt like I was drinking a caprese salad, and I was a big fan (though I know a lot of people aren't into drinking their food, and you know what, that's fair). The splash of tomato water had an ever-so-slight hint of sweetness which was cut nicely by the vodka. The fragrant basil seeped into the drink, and everything came together wonderfully. The kite dancing was a lighter and sweeter option. Citrusy and slightly tart, if you're more into cosmos than dirty martinis, this is the option for you. My mom preferred the henchman, while I barely let go of the caprese royale! After tasting some crusty, fluffy, fresh, warm bread, our attentive and friendly server presented us with a complimentary appetizer of pot stickers and mini crab cakes. Since I don't eat meat or seafood, I didn't try either of these, but my mom loved the pot stickers! Next up, we ordered the wild mushroom salad. This salad was absolutely unreal. 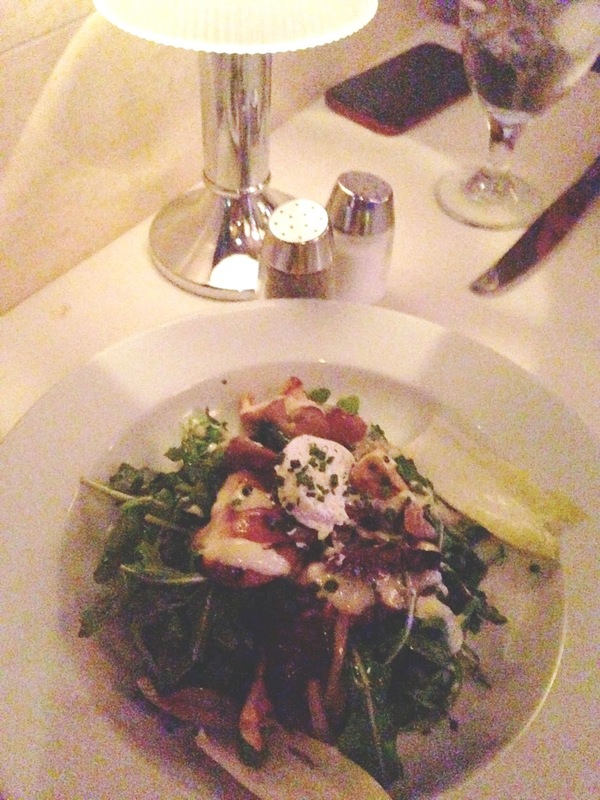 A bed of bitter arugula was softened up with warm goat cheese, gorgeously-textured sauteed mushrooms, and a creamy, sweet champagne vinaigrette. This was an indulgent salad, if I had ever experienced one. Every bite was pure decadence. Continuing on in the trend of sharing our food, we decided to split the fresh market vegetables. The fresh market vegetables is an entree of six different vegetarian sides. On that night, this included fried rice with mushrooms and scallions, roasted baby beets with candied walnuts, steamed asparagus, sauteed Monterrey style sweet corn, pan roasted wild mushrooms, and sauteed spinach with garlic and parmesan. 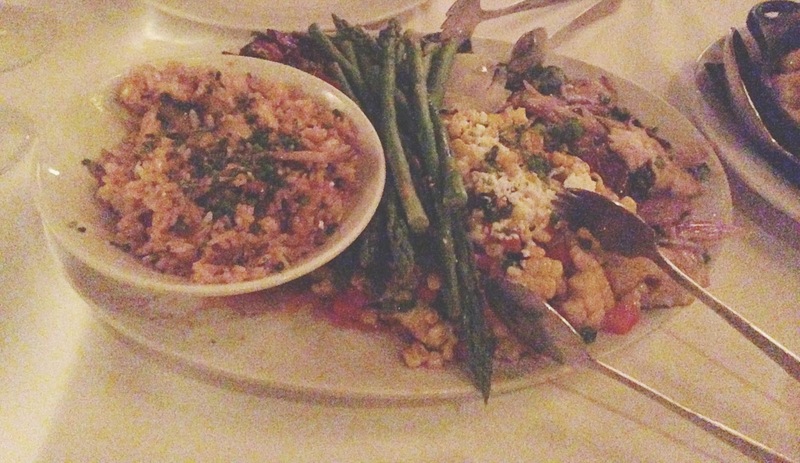 This massive plate of food was a vegetarian's dream. Heck, it'd be anyone's dream! 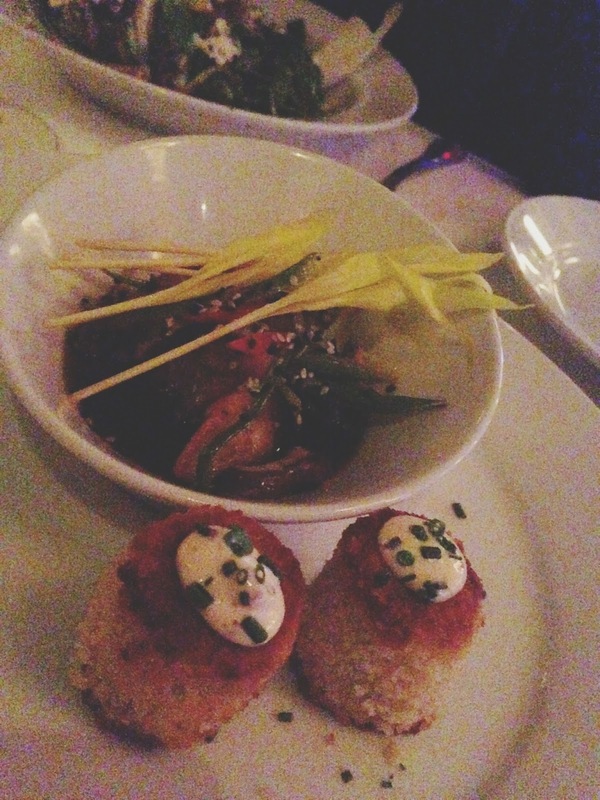 Even though the restaurant is acclaimed for its seafood offerings, we were completely floored by this dish. The fried rice was earthy and exploding with texture and rich flavors. The beets were sweet and soft, with a fun crunch from the walnuts. Ripe and juicy, the cotijo cheese-topped corn was creamy and playful. The mushrooms were strong and comforting, and the sauteed spinach was smooth and velvety. The asparagus was the only side that didn't blow me away, but it was steamed perfectly and not overcooked or soggy. Overall, this dish really hit it out of the park! There was so much food on the plate that I had enough leftovers for two more meals. We had to order a side of truffled macaroni and cheese of course. Houston, you have to try this. We died. We died a hundred times eating this. It was absolutely spectacular. 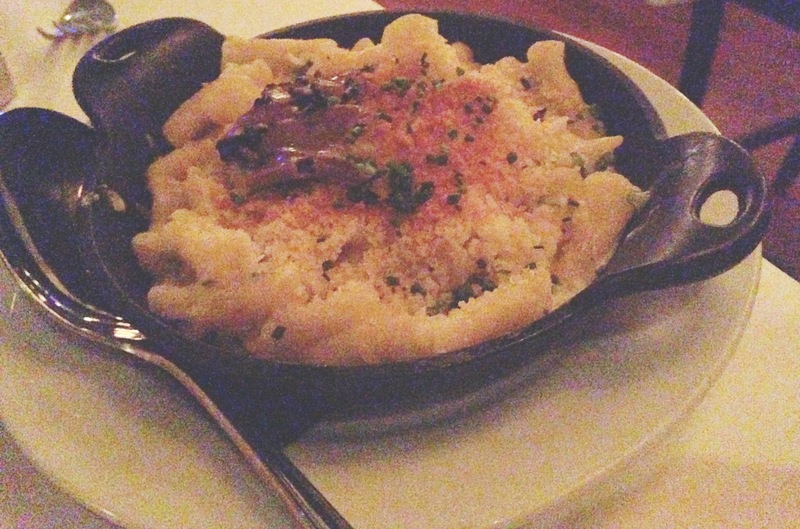 The mac and cheese/truffle dance is a delicate balance, and one that this restaurant has mastered perfectly. Incredibly creamy, but not offensively cheesy, this hearty, earthy side is comfort food at it's finest, with an elevated level of fanciness. The breadcrumbs melted into the penne noodles and sauce, while still maintaining a light crunch, and the end result was outstanding. I can't adequately describe just how wonderful this mac and cheese was. Looks like you'll just have to try it for yourself! Finally, since we obviously hadn't eaten enough food (ha. 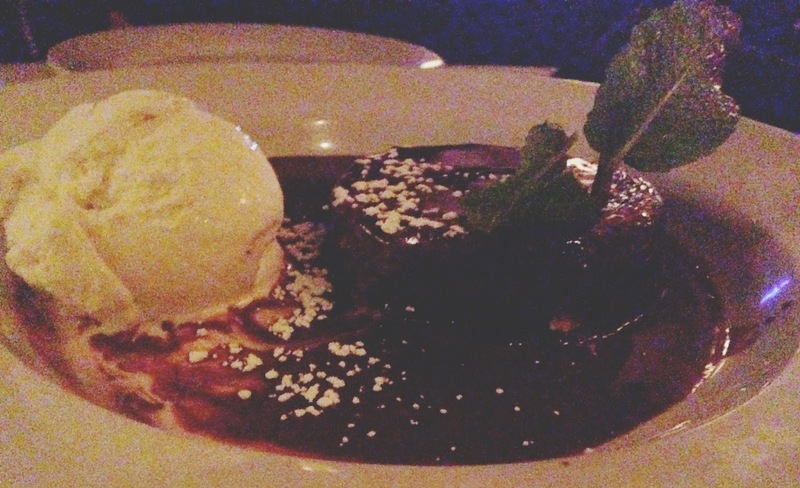 ), we nabbed ourselves a rich, indulgent, oozing piece of hot chocolate Godiva cake, with sweet vanilla bean ice cream. This exceptionally pleasurable dessert stacked right up there with the rest of the amazing food we had eaten that night. Eddie V's is a fine dining chain restaurant that consistently serves dizzying, incredible food. It definitely falls into my "special occasion restaurant" list, so when you're going to splurge, Eddie V's (in Houston's West Ave or City Centre) is a worthy place to do it. Furthermore, these fun James Bond-inspired Belvedere martinis will be available for the next few weeks, so if you want to just stop in for a drink at the classy bar and try out your best 007 impression, you still have time! Omgah drooling that veg plate!!! And that cake!!! When I went with Erik, we got the bananas foster cake (I think, it was some sort of banana/caramel-y cake thing) and it was freaking fantastic. I've been dying to go back just for dessert ever since! !